Dept. of Library and Information Sci. Faculty of Education, Ahmadu Bello University Zaria. Digitalization of information has made access to medical science records and information easy and fast. Therefore, the need for developing skills, knowledge and understanding in the use of electronic information devices cannot be over emphasized. However, the reverse is what is commonly seen in most of our institutions of learning. This study was aim at studying the utilization of digital information resources (DIR) for academic development in School of Health Information Management ABUTH, Zaria. Two hundred and thirty six (236) structured questionnaires were administered using the stratified random sampling technique. The data collected was analyzed using frequency and simple percentage statistics. The study revealed that while e-Text books (53.6%) and Internet facilities (38.0%) top the most frequently used digital resource materials, Irregular power supply (31.8 %) and poor network services (24.8 %) top the challenges faced in accessing DIR by the respondents. 52.6% of the respondents accessed DIR materials by subscription. 26.0% is by loan while 20.7% is by purchase. This finding suggests that there is under-utilization of DIR because of infrastructural changes. It is therefore recommended that all relevant stake holders should invest heavily in ensure ring adequate provision of digital resource materials in the Libraries. Key words: Digitalization, utilization, Information Management, Resources. The library or information center is the heart of the academic community since learning and research is the core academic program (Bashir, 2013). The digitalization of information and communication has no doubt brought about changes and rapid development in all human endeavours especially in medical science education. Thus, the ability for timely acquisition, retrieval and utilization of relevant and accurate information has become an important attribute in teaching and learning process especially among medical students. Digital or electronic information resources are those information resources that contain information other than in written format. According to Bandele (2006), digital information resources are tools that comprise electronic devices which are utilized for information and communication needs of institutions, organization, students and individuals. Such electronic devices include computers (desktop/laptops), internet networking, telephone (handsets/mobile phones), video and multimedia devices. Adegun (2007) revealed that presently in Nigeria, the use of E-learning in the educational sector is still at the rudimentary stage. Management Students. Digitalization of information has made access to records and information easy and fast. It gives room for unrestricted access to students for relevant information and development in various subject areas. Access to latest text books, journals, books published by reputable scholars in various disciplines is guaranteed for students. The internet provides e-mail services generally utilized for correspondences and dissemination of information. Student read comments from daily mails (newspaper), use chat room where activities take place lively and the use of World Wide Web (WWW) for necessary information (Adebayo, 2007). Digital information or what may be referred to as ICT has increased importance within the school curriculum, support student-teachers in teaching and learning process, enables students to access, share, analyses and present information gained from a variety of sources and in many different ways and encourages active participation in classroom interaction as knowledge is shared (Emenilse, 2003). However, the reverse is what is commonly seen in our institutions of learning. Most students are faced with challenges of sourcing and utilization of digital information resources ranging due to several reasons, which may include inadequate digital facilities. Most of our schools do not have enough functional electronic information resource equipment that can meet the need the need of the rapidly growing student population. Another reason is that the majority of the students are not well trained or skilled with the knowledge of information technology particularly the practical aspect of it. Poor quality service delivery is another reason that poses challenges to our students. This is locally referred to as “No Network”. The evident of poor services develop lack of confidence in the system. Lack of maintenance and regular services or replacement of spare parts when faulty is also a challenge to students. Poor power (electricity) supply has greatly disrupted the smooth running of electronic services so much that most students have resulted to fate, while become nonchalant towards anything digital or electronic. What impact has these on the students and how can some of these reasons be corrected? According to Missen et al (2005), the Internet poses African Universities to gain equal footing with their sister institutions in the more developed countries. It is imperative that Institution of learning be connected if they are not to be rendered irrelevant in the modern academic world. Harold (1998) supported this by saying the weakness of the present situation lies in the absence of a nationally coordinated programme of bibliographical activity, and in the lack of coordination between organisation and institutions with related interest. It is against this background that this study was carried out. This study was conducted in the School of Health Information Management (SHIM) A.B.U.T.H Zaria. The school is located in the old Ahmadu Bello University Teaching Hospital Tudun Wada Zaria and has a population of approximately 600 students. Stratified proportionate random sampling was adopted using the open and close ended structured questionnaire. The questionnaire was designed after the pattern of Aina (2004). The questionnaire was divided into sections. Section A was on personal data. Section B was as on knowledge and availability of library information resources (LIR) and section C was on the use of LIR, while Section D was on Challenges encountered in the access and use of DIR. The data generated from the questionnaires was analysed by using frequency and simple percentage statistics. Out of the two hundred and thirty-six (236) questionnaires administered, only two hundred and twelve (212) was eturned correctly completed. The finding in this study is similar to most studies carried out on utilization of digital resources. 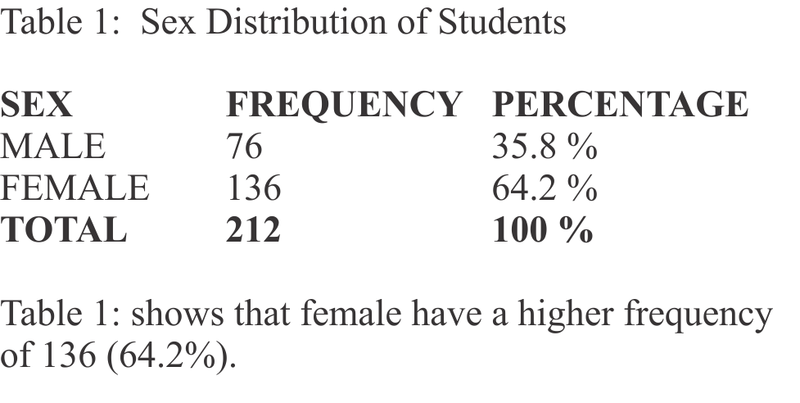 The results show that female respondents 136 (64.2%) were more than that of the male 76 (35.8%). The age range of the respondents with the highest percentage (48.1%), was 21-30 year. The respondents 138 (65.1%) with National Diploma Certificate are more than those with other educational qualifications. Text books 158 (40.1%) and Internet facilities 152 (38.6%) constituted the highest percentage of digital resource materials available in the institution. The most frequent channel of accessing Digital Information Resources by the students was by subscription 142 (52.6%). Text books and internet facilities also top the most frequently used DIR with 72 (34.6%) and 46 (22.1%) respectively. 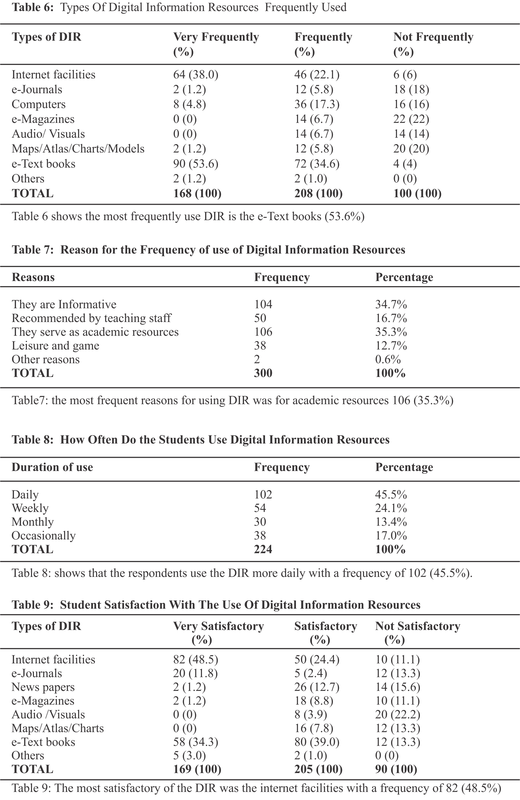 The most frequent reasons for using DIR was for academic resources 106 (35.3%) and for information 104 (34.7%). This study also shows that the respondents use the DIR more daily 102 (45.5%) than weekly usage of frequency 54 (24.1%). Eighty two (48.5%) of the respondents were very satisfactory with use of Internet facilities while, 20 (22.2) of the respondents were not satisfied with the use of Audio Visual. The most frequent challenges of accessing DIR reported the students was irregular power supply 100 (31.8 %) followed by Net Work problems 78 (24.8 %). In a recent study conducted by the Global information technology (2005), the report used the Networked Readiness index (NRI) covering a total of 115 economies in 2005-2006, to measure the degree of preparation of a nation or community to participate in and benefit from ICT developments. Nigeria was ranked 90th out of the 115 countries surveyed, united states of America toped the list, followed by Singapore, Denmark, Iceland, Finland, Canada, Taiwan, Sweden, Switzerland and the United Kingdom and so on. Also, Nigeria was ranked 86th out of 104 countries surveyed in 2004 (Global information Technology, 2004). This study recorded a general low usage and patronage of digital information resources when compared to results from other part of the world. This, according to Tiefel (2004) may be due to the fact that most library users are unaware of the quality and variety of information available.. Internet is the most frequently used DIR, which is similar to this finding. Falak (2003) reported the rapid growth and use of e-books in school’s colleges and universities in developing countries, which is not the case with finding of this study where text books seem to be the highest. Most of these studies reported high usage of internet resources (De Vicente et al 2004; Falk, 2003). High usage was `attributed to a number of factors including the freely available access, the ease of use and its currency. Gakibayo (2001) and Agaba (2003) carried out a study on e-resources usage at Makerere University of Science and Technology; the results of this study indicated low usage. Zaki (1991), pointed out that the poor library use background by students in using library facilities, had led them to carry this problem with them to Universities and higher institutions. The finding from this study suggests that though, the DIR has provided a wider access to global information resources, these resources are not effectively utilized due to varying factors. There is need to equip end-users with skills such as information literacy skills, information retrieval skills, computer skills among others as a strategy to promote e-resource usage among medical students. We are grateful to the management of ABUTH Zaria, especially the Coordinator and students of School of Health Information Management ABUTH Zaria, for the support and cooperation. 1. Aina, L.O (2004). Library and information science Test for Africa. Ibadan, University press. 2. Abolade, A.O. and M.O. Yusuf,( 2005) information and communication technology and the Nigerian teacher education. Afr. J. Edu, studies, 3(16): 19-23. 4. Bashir J M (2013)Provision and utilization of electronic information resources in Federal college of education libraries: a case study of federal college of education library Zaria. 5. International Journal of Education and Development using information and communication technology (IJEDICT), 2006), vol. 2, issue 3, pp: 70-85. 6. Medwell Journals, 2008. Asian Journal of information technology 7 (7): 2ac -295. 7. Al Fadhli,M.S and ,Johnson,I.M (2006), “Electronic document delivery in Academic and research organization in the Gulf States: a case study of Kuwait”, Information Development, Vol. 22No.1, pp.32-37. 9. Jensen, M. (2007), Information communication (ICTs) in Africa: a status report, Paper presented at the Third Task Force meeting of the UN ICT Task Force; New York. 12. Afolabi, M.O. (2007), Paper presented at Electronic Information for libraries Network (elFL.net) workshop Obafemi Awolo University, lle-Ife, Nigeria. 13. Fatoki, O. C. ( 2007). Digitalization of library materials in Nigeria: Issues and heritage of University of Nigeria, Nsukka: Issues and current status. A paper presented at the Nigeria library Association (NLA) 4th Annual National Conference and AGM 26-31 July 2009 Ibadan. 14. Imo, N. T. & Igbo H.U. (2011). Challenge of digitalizing information resources in Nigeria university libraries. A paper presented at the 49th NLA National Conference/ AGM 10th- 15th July. Awka. 17. Adeyinka, T, Adedeji, T. , Ayen, C.O. & Omoba, R.O. (2008). Self-Efficacyand Use of Electronic Information as Predictors of Academic Performance. Online Electronic Journal of Academic and Special Librarianship, 8(2), 1-17.